vasterom: Do Mushrooms Fall Under Vegetarian Category or Non-Vegetarian? 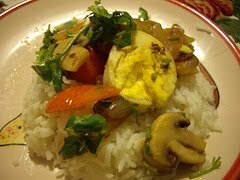 Do Mushrooms Fall Under Vegetarian Category or Non-Vegetarian? I started doing a bit of research about this in Gita, The Holy Book of Hindus. According to Krishna or Krishna consciousness, if you will, don't indulge in over/under eating. The gist of my research is, food is divided in to 3 types. Now it is up to us to decide where each food falls. 1. Goodness: Milk, honey, vegetables, rice, lentils etc. If you ask me, eggs are also vegetarian. They are not fertilized by sperm. By definition, you are not causing pain to the egg when you make an omelet (just like you don't cause pain to carrots when you dig them out of soil). In my definition, egg falls into Goodness category. Counter argument is that we need to classify food based on cell-structure not where it comes from. 2. Passion: Anything which is hot (chili-hot) and spicy falls into this category. From what I understand, there is no clear definition of which foods fall under this category. 3. Ignorance: Meat and meat products fall under this category. (According to Gita). It always surprised me that we give so much importance to religion, peace etc, yet Gita itself is a justification of why war is essential at times. Of course I fully believe that it is the Holiest of texts till date, yet the irony is not lost. Argument one: Recently mushroom farmers have started using fish emulsion spray derived from fishes for faster growth. So a fertilizer, which is not pure vegetarian is being used on a vegetarian item. That is the reason why some vegetarians are not clear whether to eat mushrooms. Argument 2: Every single second we kill millions of bacteria and other microscopic creatures by inhaling air. So its all about what definitions people give to justify their eating habits. Another thing is, how many of us realize that it's not about meat or non-meat products but its about not killing animals for our wants/needs? For the same reason even leather cloths should also be a strict No for a practicing vegetarian. Can we live without eating meat? Yes. But do I propagate that eating vegetarian food is the way to go? No. I am not against eating meat and I don't try to persuade those who do to consider my perspective.